The exhibition is held on the ground floor of the Copper-Hewitt Museum. It is divided into six themes; each is displayed in a separate space with distinctive design features. The exhibition includes 350 objects such as jewelry pieces, watches, casings and boxes, original drawing documenting the elaborate design process, special order books, catalogues and images of famous personalities who wore some of the objects on display. The themes of the exhibition are Innovation, Transformations, nature as Inspiration, Exoticism, Fashion and Personalities. Each is displayed in a separate space (except for Exoticism and Fashion which share one space) with distinctive design features that echo both the design motifs of the objects and the unique features of each room in the mention. In this first room the visitor will find the introductory text and the room’s thematic wall text. The theme of the room is Innovation, both stylistically and technically. 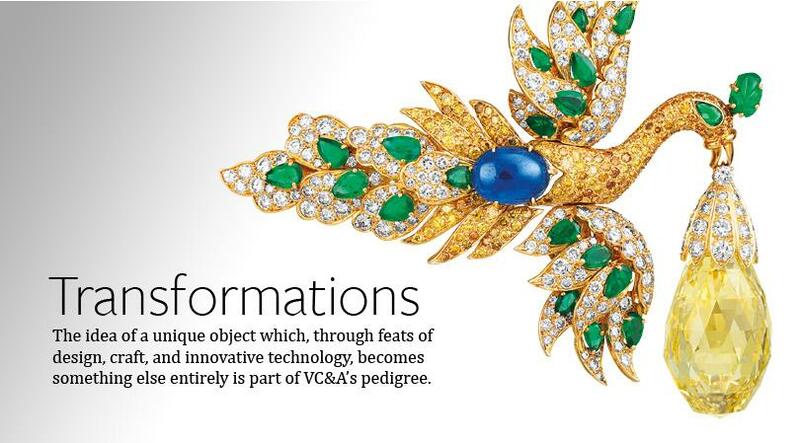 The main focus is on the Mystery Setting, a technique invented and perfected by the firm in which “matched gem stones are grooved and set in channels so the setting is invisible.” A monitor presents a video that captures the making of this complicated process. Only after seeing the video was I able to truly appreciate the complexity of the process and therefore the value of the pieces. 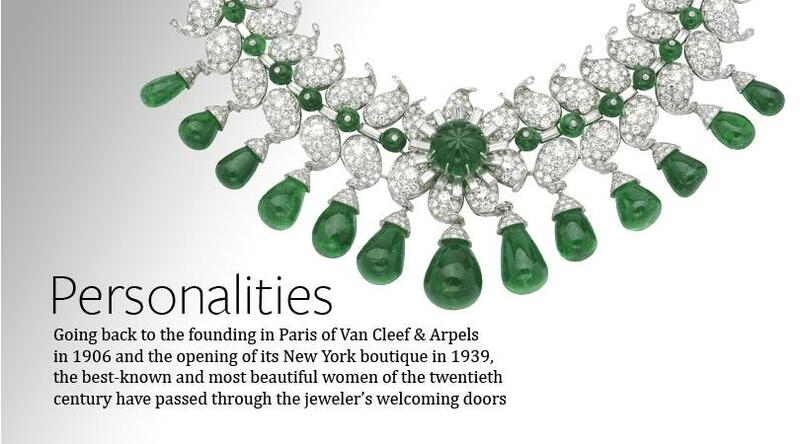 Also displayed are examples of motifs similar to the Art Deco style which were used five years prior to the official initiation of the style in 1925, establishing Van Cleef & Arpels as a taste maker and leader in the world of design. A large elongated table is set in the center of the room, on which approximately eighty objects are housed inside one large oval case. Above the case silvery leaf shapes are dangling, enhancing and reflecting the light. Each object, or a small grouping of objects, is placed on small beige stand angled to allow better view- similar to display in jewelry store. Next to the objects are numbers that correlates to the numbers in a brochure, given to each visitor upon admission, to which the visitor should refer if he or she is interested to learn more. Therefore, there are no individual labels throughout the exhibition. It seems that the amount of objects on display, although providing a broad picture of the history and evolution of the firm, does not leave much space for the labels. 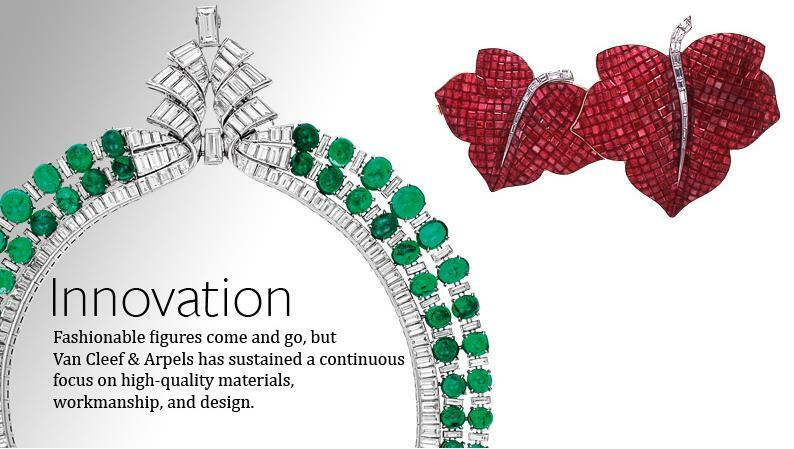 It is clear that the designers have made a conscious decision to create a display similar to what we might find upon visiting Van Cleef & Arpels store on Fifth Avenue, rather than in a museum setting. In an interview found on the museum website the designer Patrick Jouin, from the French studio Jouin Manku, explains that he wanted the visitors to lean forward to look at the objects, they will then see their own reflection on the glass and on top of the objects, as if they themselves are wearing the jewelry. It makes sense then that the designers preferred to eliminate design features associated with a museum display- the labels- to achieve their vision. The visual effect is without doubt striking; the presentation of the objects is beautiful and provides a clean looking background for their display. Personally I found referring to the brochure a tedious task, and a solution that do not serve best the objects or the exhibition as a whole. The second room is themed Transformations. Once again a large table is placed at the center of the room; however, the atmosphere in the room is very different, the objects on the table are set inside bubble-shaped individual cases, as if they were served for dinner in the mansion’s dining room. In each case 2-5 objects with a similar design theme are grouped together. Here too the theme is studied from two aspects, the first includes objects that literally transform into other objects (such as the Zip necklace, necklace’s pendant that can be worn as a brooch and a necklace that converts into bracelet), and the second objects that illustrates the stylistic transformation of the firm as a result of its move from Paris to New York during World War II. A monitor presents a short video that illustrates how the Zip necklace zips to become a bracelet. Unlike the film in the first room this one looks like a television commercial, and not necessarily a good one. Across the room on the south wall are two additional cases with retail cards, boutique catalog and special order book which quite nicely enhance the theme of the room as shown through the objects. 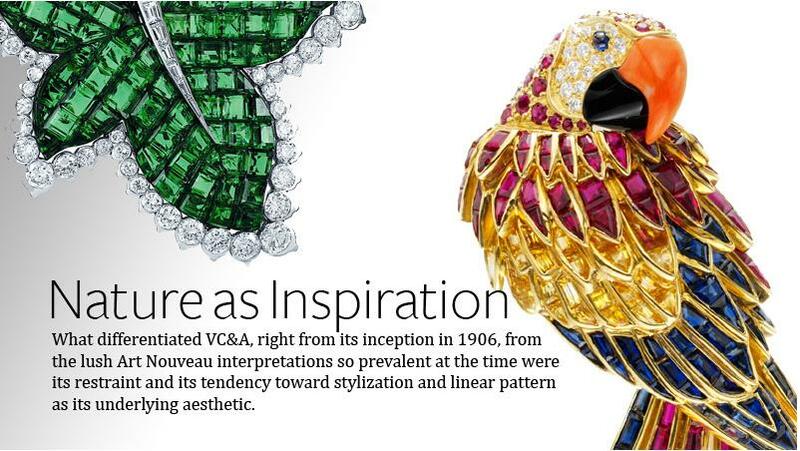 According to the wall text, the objects in the third room titled Nature as Inspiration represents Van Cleef & Arpels’ emphasis on “evoking the sprit, rather than slavishly copying the [natural] form.” They give as an example their famous snowflakes, made of gold and studded with diamonds, and the use of multiple colored gemstones together as an echo for a bouquet of flowers. The most striking feature in the room is found on the four tables in the corners, surrounding the main table. It seems as if one object is standing on each, uncovered and unprotected. When the visitor approaches, he or she, discovers that in fact it is only a hologram, the real object is embedded in the table under a glass. The effect is beautiful and exciting; I felt at once encouraged to break the museum’s rules – to touch the object- and teased at for thinking this precious jewelry is within my reach, both physically and financially. It is demonstrated again in this room, that when the designers decided to show so many objects together (the main case contains over fifty objects) it is hard for the viewer to grasp the beauty and uniqueness of each piece. In my opinion when the pieces are displayed alone or in small groupings they better convey the themes of the exhibition. In the corridor that leads from the room to the sitting area one piece of jewelry, a Mystery –Set peony, is displayed inside a large glass bubble that stands on one leg. It is shown through a magnifying glass, which allows the visitor to admire the smallest details. As I walked past I realized the back is also visible, though not magnified, and allows admiring the complexity and sophistication of the Mystery- Setting. It is the only piece in the exhibition visible from the back. It seems that the use of technology in this context was to the benefit of the objects and the themes of the exhibition. It further illustrates my point that the designers did a better job when displaying single objects. The fourth room is divided into two spaces and two themes: Exoticism and Fashion. The room is bright, with strong white light, white curved tables and cream fringed curtain that divides the room to one large and one smaller space. On both tables the objects are displayed inside cases in organic round shapes. While the south table, dedicated to Exoticism, has labels clearly indicating the region or culture that influenced the design, the theme of Fashion as displayed on the north table is not very clear. Although the text regarding the Fashion theme states that “fashion and jewelry are forever intertwined, reflecting the ethos of changing times,” the objects on display did not support that statement. 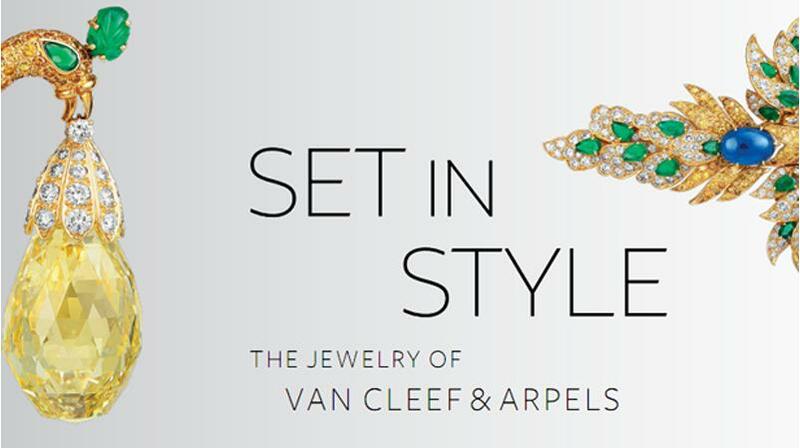 I was not convinced that Van Cleef & Arples “understood the link between fashion and jewelry as a powerful emotional sensibility that greatly influences contemporary design.” I would have loved to see actual garments combined with the jewelry, and how their design and motifs are reflected in one another. Although jewelry and fashion are strongly linked the fashion aspect received the smallest portion of the exhibition and the least attention. 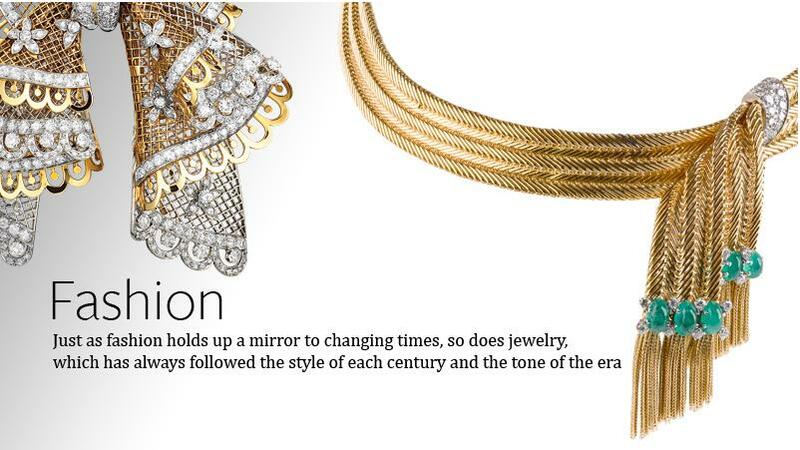 The last space is set in a long corridor and dedicated to personalities who wore the jewelry. The objects are displayed in two cases on the wall, on top of several layers of organic wave like shapes in shades of gray, punctured by small little holes from which a bluish light is showing. Next to each object a label indicating who was the women who wore it. Across the room on the wall are actual picture of those famous women. In my opinion it is the best room in the exhibition, as it truly illustrates the power of the pieces- when combined with clothes, body and personality. I would recommend this exhibition both to my peers and my friends. I believe the visual appeal of the exhibition is broad and the objects are beautiful. Although the design of the exhibition is without any doubt arresting, I believe it takes over other equally important aspects. I left the exhibition feeling I have watched a promotional exhibition rather than a retrospective of the firm. After watching the videos and carefully observing the objects, I have better understanding of the quality of design and craft of the firm and its history, but it took two visits of nearly two hours each time. I think the ordinary visitor will be overwhelmed by the amount of objects, and will not benefit from the label-free display. On View through June 5th. Cooper-Hewitt, National Design Museum corner of 91st Street and Fifth Avenue, New York City. 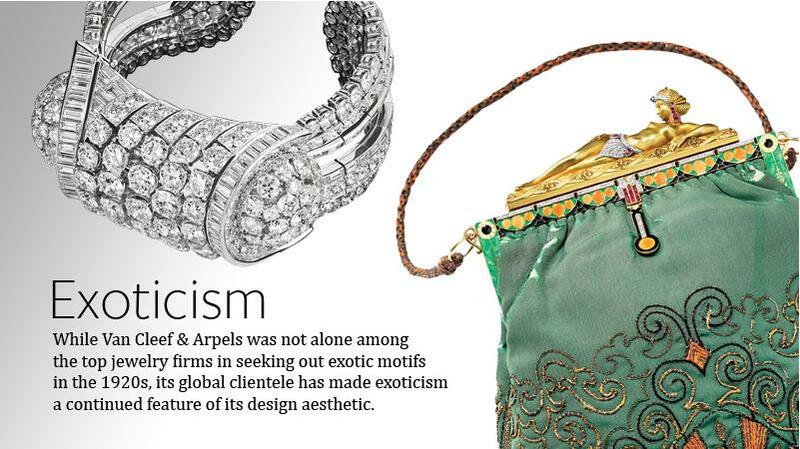 This entry was posted in Exhibition and tagged Copper Hewitt, Jewelry Design, Jouin Manku, Van Cleef & Arpels. Bookmark the permalink.